Stacia Kennedy’s Pregnancy Countdown has officially begun! So hard to believe, but yesterday marked 30 days until Ava Kalea Kennedy is scheduled to arrive to our world! It seems like just yesterday when she was still just a (unnamed thought) and twinkle in our eyes. Stacia and I were married less than a year ago and although we had discussed having another child (our first together), we still were not certain we were going to make it happen. Personally I felt that it might be too difficult being such an old (experienced ?) dad. Difficult for Stacia and for Ava. Well, Ava did not get a vote (although there are A LOT of people who feel like children DO pick their parents). Stacia wanted us to have a kid together, as she was alone when pregnant with Makaya and she did not get to experience having a child as a partnership. She is my Queen (and Jackie and Ava are my princesses) and I want her to be the happiest person on the face of the planet, so I put aside all my concerns and decided to just go for it. What the heck, you only live once – right? This pregnancy countdown could turnout to be very interesting. Were super excited to find out that Stacia was pregnant! So excited that we went through around 7 different pregnancy tests before we got a positive result … But after first going to the doctor and having it confirmed that she was pregnant, we both kind of thought that their prediction for a due date was a bit late …. That tidbit of information, combined with the fact that Makaya was born nearly a month earlier than predicted, makes me feel like anything could happen – and that Ava Kalea could decide to make her appearance sooner than later. At pretty much any time … Only time will tell and until then, we will do our best to be like the Boy Scouts and Be Prepared. 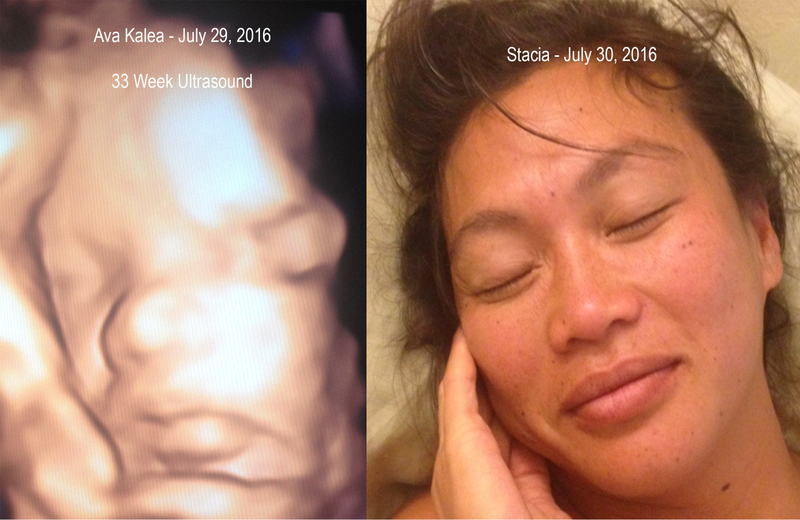 Regardless, tomorrow is Stacia’s last scheduled ultrasound before her due date – and we are definitely looking forward to seeing Ava Kalea again …… and the pregnancy countdown continues ….. Thank you so much for reading, commenting, sharing and for your amazingly positive thoughts and vibes!